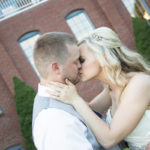 Gorgeous wedding photographed at Thornewood Castle in Tacoma, Washington! Heather and Malcolm are two of the sweetest people you will EVER meet! I adore these smiling faces. From the moment we first started chatting about their wedding plans, I knew that these two would be fun! We couldn’t have had better weather. The light was simply delicious for their first look and garden ceremony! The whole day was full of endless laughter. Afterwards, they celebrated with friends and family in Thornewood’s formal dining room! These two were full of laughter and so much fun!